I weep for Turkey and the situation they are in. I have deep empathy for them - ALL. Not only the recent overnight attempted revolution but the ongoing situation for the state of the nation. I picked up this reflection/article online by Mike Walsh who I don't know. I want share it with you. It was meant to be a relaxing weekend at a friend’s wedding at a vineyard outside Istanbul. Instead, it was twelve harrowing hours spent evading a military curfew, navigating thousands of protestors, and a mad dash on foot to the airport to escape. This is the story of how I ended up in the middle of a Turkish military coup, and what it taught me about the flip side of globalization. My wife and I landed at Ataturk International airport at around 8.30pm on a warm Friday evening. Istanbul airport, if you haven’t been, is a bit like flying into the Mos Eisley Cantina in Star Wars: tourists, traders and shady types from the wrong side of the galaxy. The traffic leaving the airport was, as always, terrible. Traffic in the ‘Queen of Cities’ is a subject of constant discussion, anguish and consternation by the locals. That evening, it took us almost two hours to reach the first bridge that spans the Bosphorus, the waterway that links the continent of Europe with that of Asia. As we approached, we noticed that the entire lane heading in the opposite direction had been stopped by a large group of soldiers and military vehicles. My first thought on seeing the soldiers was that perhaps it was some kind of drill, or that there had been a bomb threat. Terror attacks had been a recent trend in the city. Just a few weeks prior, the airport itself had been bombed. What we didn’t realise, as we slowly inched past the massed troops and tanks, was that just an hour later — those very soldiers would be firing live rounds into the people assembled there, with the support of military attack helicopters and even a F–16 fighter jet, which would fly under the actual bridge. We finally arrived at the home of my wife’s family, and sat down for a traditional, and delicious Turkish meal. By the time we had finished eating our mezzes, all the phones in the house started to ring. Everyone around me was talking in Turkish at the same time, and it was only when they turned on the television that I realised what was going on. Like a scene out of Syria, Egypt or Tunisia — it transpired that a section of the military had taken control over key infrastructure in Istanbul, including both of the main bridges and the airport. There were unconfirmed reports of explosions, gunfire, and that in the capital city of Ankara, the presidential palace had been targeted with missiles and explosives. ‘What are we going to do now?’ asked my wife, turning from the screen with a terrified expression on her face. As I stood frozen, watching the TV, the rest of her family sprung into action, making plans to get petrol, cash and food — accustomed to a city where protests and earthquakes were regular occurrences. I looked at her in silence for a few more beats, as images of tanks, explosions and fire fringed her outline. ‘We need to go,’ I said finally. ‘Right now’. ‘The military have declared martial law,’ she replied shaking her head, ‘no one is allowed out of their homes’. In retrospect, if we had actually known the full extent of the violence in the streets that night, the explosions and terror that would eventually claim the lives of 265 people, and critically injure over 1500 — we might have just stayed indoors. Instead we packed rapidly, and piled into my wife’s father’s van — a 7-seat Citroen more appropriate for leisurely family road trips, than stealth missions evading military curfews. The streets were quiet at first, but it wasn’t long before we started encountering huge crowds of people, drawn to the streets to protest against the tightening fist of the military coup. Our goal was to reach Sabiha Gokcen, a regional airport on the Asian side of Istanbul. Ataturk was ringed by tanks, but we hoped that perhaps the soldiers hadn’t had time to close the smaller airport. 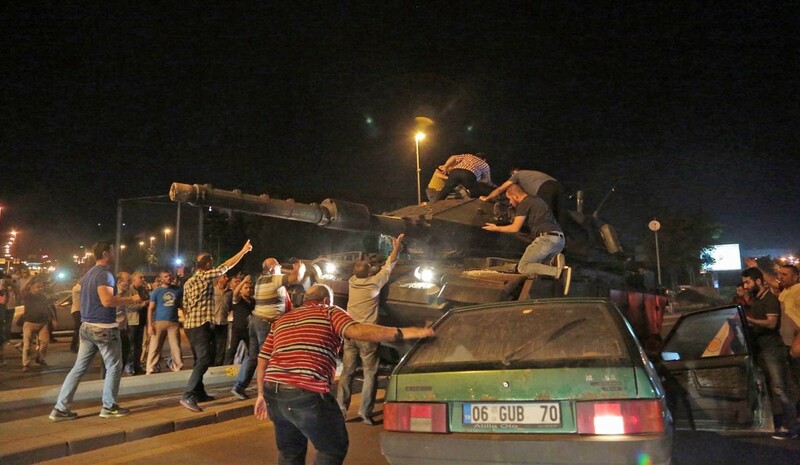 But as we neared the airport, the streets became more congested with protestors shaking cars and climbing on tanks. Eventually, we had to abandon the car. The moon was bright overhead, lighting up a surreal scene of people waving Turkish flags, abandoned semi-trailers and buses set up as barricades. Ahead was our goal, the outlines of the airport building. So, still 3km from the terminal, we unloaded our luggage, hugged our family, and with too many bags to be safely navigating the crowded streets, started running. When we finally made it, we found ourselves amongst a few others stubborn or foolish enough to have braved the trip on foot, only to find a departures board that was depressingly uniform. Against every flight for the next six hours, was the word ‘iptal’, which is Turkish for ‘cancelled’. I decided to gamble on a 9.40am flight to Milan, in the hope that services might resume. I don’t think I have ever been happier or more relieved, than when at around 9am, a gate number showed up next to the flight I had booked. But it wasn’t until we were wheels up in the air, that I allowed myself to breathe a sigh of relief. Later, watching the coverage of the failed coup from our hotel in Italy, it was hard to imagine that we were actually there, and had narrowly avoided the tragic violence that others, less fortunate, had succumbed to. More importantly, having lived that brief moment of madness, I realised I could no longer think impartially about the kinds of horrors that so many immigrants and refugees across Europe have had to experience on a daily basis. Much has been written and discussed lately about the winners and losers of globalization. Many feel, and quite rightly, that even as the world has become more networked and connected, their lives have not improved as much as others. But in light of the previous evening’s adventures, I realised that there was another side to this, that was not just about selfish economics and fears of rampant immigration. Some weeks ago, I interviewed Professor Ian Goldin for my podcast, ‘Between Worlds’. In Goldin’s view, the modern age is inextricably connected and interdependent. Those connections are a source of vulnerability (what he calls ‘The Butterfly Defect’) whether it be pandemics, financial crises or terrorism, but they are also the drivers behind a new Renaissance of innovation, invention and creation. In other words, we are both empowered and weakened by our connections. Our 21st century, global order is flawed, but it is also fragile and easily broken. Despite all of the failings of globalization, I strongly believe that we are still safer when cities, countries, cultures and communities are interconnected. The ties that bind nations, are a natural enemy to nativism. In my view, the real issue for the future is not whether we should Brexit or build walls — but rather to ask ourselves and our leaders — what is it that we now need to do to move beyond our differences and help divided communities grow in trust, prosperity and peace?